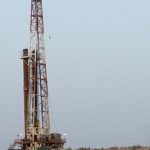 Home › Technical Feature › You only find oil by drilling wells…in the Right Place..! When I was a junior geophysicist learning the seismic interpretation business in the UK North Sea my immediate boss (who was not a geophysicist) was fond of quoting the oft heard expression “You only find oil by drilling wells.” One might have assumed that this phrase was as old as the oil business itself but (until recently) the earliest written example I could find dated back to only 1980. It appears in The Hunters by the American geologist John Alan Masters (1927-2011) founder of Canadian Hunter Exploration Ltd.
As a geophysicist I would try to correct my boss by telling him that “You only find oil by drilling wells in the right place” and that geophysics was the key to this. The seismic imaging process was the best way of mapping the sub-surface structure between and away from wells and for identifying prospects. In addition seismic data was crucial for determining whether a discovery contained economic volumes of hydrocarbons. 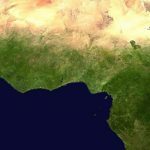 Therefore even in technically challenging areas such as thrust belts, where seismic imaging may be very poor, it was still considered wise to shoot seismic data. 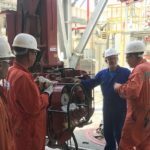 But whenever a dry hole was drilled my sceptical boss wondered whether it might be possible to dispense with geophysics altogether. He suggested that greater exploration success might be achieved by simply drilling wells in either a random or a regularly spaced pattern. To me the idea of searching for oil and gas by replacing relatively low cost seismic data with large numbers of high cost wells seemed intuitively incorrect. But proving this was not straightforward. However any readers who feel this might be an academic exercise may be surprised to learn that I still occasionally come across companies willing to consider drilling wells on locations chosen without the use of seismic data! 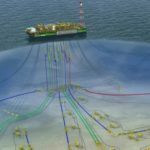 Not surprisingly I try to dissuade them from such a decision but the real surprise to me is the idea that the management of a modern E&P company might want to try this today. One possible method of proof might be to compare the success rates for an area explored using geophysics with those from an area explored without (or partially without) geophysical methods. The UK Southern North Sea is a good example of an area where seismic reflection data has been used throughout its entire exploration and production history. 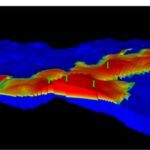 2D seismic data had been acquired as early as 1962, two years before the Continental Shelf Act (1964) defined the licences. The seismic data was used to select the locations of the early exploration wells, including BP’s Well 48/6-1, which encountered gas in the Permian Rotliegendes Sandstone in the West Sole Field in 1965, the first commercial gas discovery. 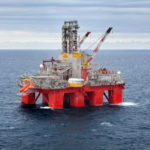 Data from the UK Oil and Gas Authority website shows that by the end of 2016 a total of 568 exploration wells had been drilled within the UK Southern North Sea. Of these 154 had discovered commercial gas fields (including satellite fields.) Thus we can estimate the average chance of commercial success in the UK Southern North Sea to be about 27% or slightly better than 1 in 4 wells. Gold is where you find it, according to an old adage, but, judging from the record of our experience, oil must be sought first of all in our minds. Where oil really is, then, in the final analysis, is in our own heads! Most readers will be familiar with Pratt’s later (shortened) form of this expression: “Oil is found in the mind of mankind.” However several years earlier Pratt had made a study of the methods of exploration used onshore US. 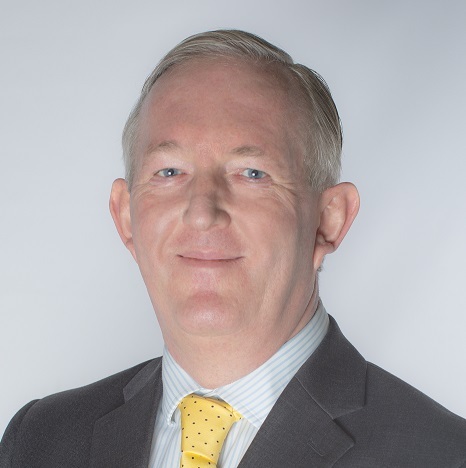 He was concerned about the apparent drop in discovery rates and wondered whether the industry was deficient technically in some way. Discoveries resulting from geophysical investigations. Discoveries resulting from drilling deeper in territory already producing in shallow sands. In the nation at large we have drilled about 1,000 dry holes for each major oil field we have found to the end of 1935. But in recent years this ratio has fallen markedly, until during the last 5 years it has averaged only 500 dry holes per major discovery. In other words the chance of commercial success between 1901 and 1935 had been only 1 in 1000 but was improving to 1 in 500. Imagine trying to get management approval today to drill a prospect with a chance of success of 1 in 500. It could be challenging! I’ve displayed the data from Owen’s expanded analysis in two separate ways. The first chart shows the number of discoveries (by any method) in given time periods. The second chart shows the total number of discoveries made by each method over the 75 year period from 1871-1945 inclusive. The charts show that from 1871 until 1925 (a period of 55 years inclusive) a total of 77 fields had been discovered without the use of geophysics. But from 1926 until 1945 (a period of only 20 years) an additional 143 fields had been discovered of which 76 had been found using geophysical methods. 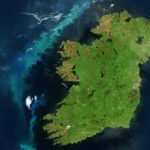 Or put another way about one-third of the 220 major discoveries had been made within the last quarter of the time period using geophysical methods. Owen’s expanded analysis also showed that the drop in discovery rates in the period 1931-1935 (which had worried Pratt) had in fact been followed by resurgence in the years 1936-1940. And that resurgence was due primarily to the increasing use of geophysics in exploration. 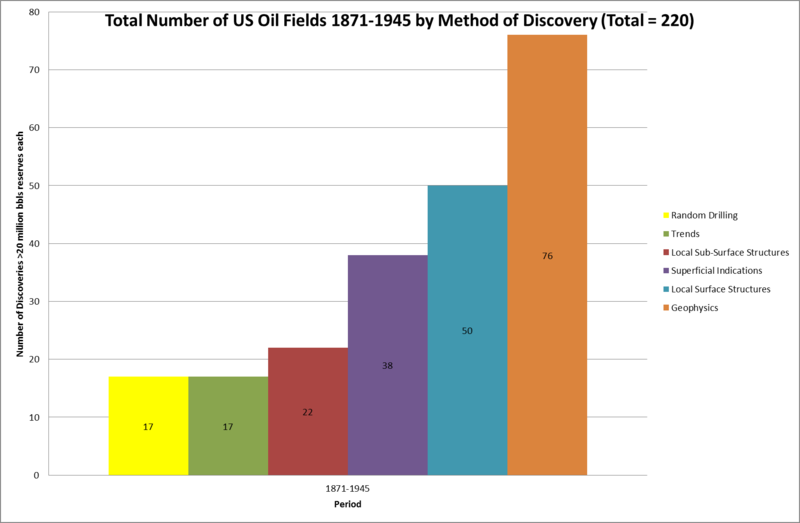 Only 17 major fields (about 8% of the total) had been discovered by random drilling over the 75 year period. Using Pratt’s estimates of discovery rates these 17 fields must have required the drilling of somewhere between 8,500 and 17,000 random exploration wells! Contrast this with the 154 commercial gas fields which were discovered with 568 exploration wells drilled in the UK Southern North Sea. If geophysics had not been used to explore this area then, using random wildcatting alone, somewhere between 77,000 and 154,000 wells would have been needed to find the fields! Given that the area of the UK Southern North Sea is roughly 48,000 sq. km. this would have required peppering the basin with wells at the rate of about 2 to 3 per sq. km. Clearly this would have been uneconomic to do so. The word “doodlebug” might today conjure up images of the German V-1 flying bomb. But in the early oil industry a doodlebug was a gadget of dubious origin and mysterious power which the user claimed could help to find oil and gas. So when geophysicists began setting up torsion balances, magnetometers and geophones in the hunt for oil these “doodlebuggers” were often viewed with suspicion. Amongst the early pioneers was the German geophysicist Ludger Mintrop (1880-1956) who had created Seismos in 1921 and began experimenting with seismic refraction techniques. That same year American geophysicist John Clarence Karcher (1894-1978) conducted seismic recording experiments in Oklahoma City that paved the way for the development of the modern seismic reflection profiling method. Another early champion of geophysics in oil and gas exploration was the American geophysicist Everette Lee DeGolyer (1886-1956) co-founder and later President of Amerada Petroleum Corporation. In 1922 he sent American geologist Donald Clinton Barton (1889-1939) to Hungary to bring back two torsion balances and they began testing one of them at Spindletop Oil Field near Beaumont, Texas. Previous drilling had shown that the field was associated with a salt dome and they wanted to measure the gravity anomaly generated by it. Initial results with geophysical surveys were mixed. Gravity and seismic refraction surveys showed very good promise for identifying salt domes but the results from the seismic reflection surveys were poor. However the years 1924 to 1928 were when geophysics finally came of age. In 1924 Donald Barton supervised the use of a torsion balance to measure gravity variations over the Nash area in Fort Bend and Brazoria Counties, Texas. The survey revealed the presence of a gravity anomaly analogous to the one generated by the salt dome at Spindletop. A well drilled by the Rycade Oil Company (Amerada) in November 1924 proved the presence of a caprock at 648 ft. and salt at 943 ft. Well No. 5 W. R. Nash was drilled on the SE flank of the structure and on the 3rd January 1926 oil was discovered in Miocene sands at 4,127 ft. Thus the Nash Salt Dome became the first oil field to have been discovered by any geophysical method. In 1924 the Gulf Production Company hired a Seismos crew to shoot a seismic refraction survey over the Orchard area in Fort Bend, Texas. The data indicated the presence of a salt dome. Well Moore No. 5 was drilled on its flank and on the 18th January 1926 oil was tested from Oligocene sands at a depth of 3,708 ft. The Orchard Dome Field was the first oil field to be credited with being discovered using the seismic refraction method. In 1927 a crew from GRC shot a seismic reflection survey over the Maud area, near the Seminole Field, in Pottawatomie County, Oklahoma. J. E. Duncan put his finger on the photographic record and interpreted correctly “This is a reflection from the Viola Limestone.” The Gypsy Oil Company (Amerada) spudded an exploration well on a structure mapped using the data and in August 1928 it was completed as an oil producer. The Maud Pool was the first oil field to be discovered using the seismic reflection method. Finally in 1927 a magnetometer survey acquired by the Sun Oil Company was used to define a serpentine plug (within the Austin Chalk) in Bastrop County, Texas. 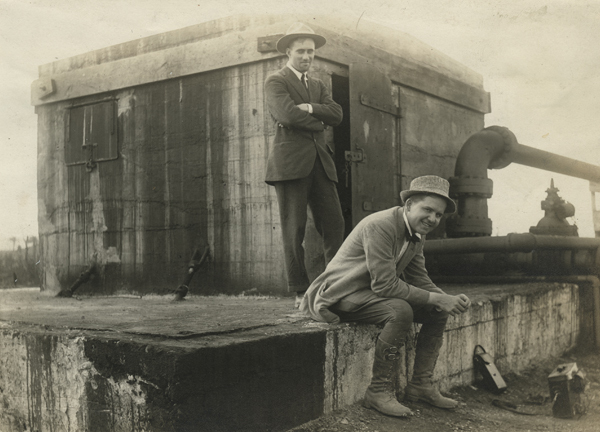 A well drilled on the structure in November 1928 discovered the Yoast Field, the first oil discovery based on a magnetic survey. From 1928 onwards the use of geophysical methods in exploration grew so rapidly that by the period 1941-1945 all but one of the 22 new fields discovered in the US had been found using geophysics. In addition it was realised very quickly that the seismic reflection method was the best geophysical tool for imaging the subsurface and so from 1930 onwards it began to supersede the other methods. Another significant milestone was passed in 1935 when the American Seismograph Company shot a seismic reflection survey in Los Angeles County California and mapped a large structure below Long Beach. The following year the General Petroleum Company drilled Well Terminal No. 1 on the prospect to 6,814 ft. TD and discovered the Wilmington Field, the first billion barrel oil field to be discovered using geophysics. However the full power of the seismic reflection method was not realised properly until the 1960s when the appearance of computers and digital software enabled data to be processed into much clearer images. 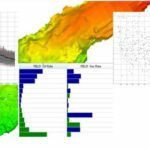 When combined with the other disciplines geophysics has been used both to map the structures of prospects and to optimize the locations of wells. 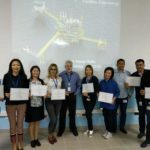 Thus geophysics has helped to ensure that companies have the greatest chance of success in finding oil and gas by drilling their wells in the right place! Many such pools are large, and, therefore, are worth finding, but it should be recognized that in the search for them the exploration must be carried out largely by the actual drilling of wells. Only the general locality can be indicated by the geologist or geophysicist, and within it the drill, through one test hole after another, must carry the exploration to completion. Butler, J. B., 1975. The West Sole Gas Field. In: Woodland, A. W. (Ed.) Petroleum and the Continental Shelf of North West Europe, Institute of Petroleum, vol. 1, Geology, pp 213-221. Carney, G. O. et. al., 1985. Energy South Central Oklahoma 1900-1930, Oklahoma State University. Collingwood, D. M., 1930. Magnetics and Geology of Yoast Field, Bastrop County, Texas, AAPG Bulletin, Vol. 14, 9, pp 1191-1197. DeGolyer, E., 1935. Notes on the Early History of Applied Geophysics in the Petroleum Industry. In: Nettleton, L. L. (ed.) Early Geophysical Papers of the Society of Exploration Geophysicists, 1947 (reprinted 1956) SEG, pp 245-254. Ellisor, A. C., 1947. Rockhounds of Houston: An Informal History of the Houston Geological Society. Published by the Houston Geological Society. Halbouty, M. T. and Hardin, G. C., 1962. Nash Salt Dome, Fort Bend and Brazoria Counties, Texas. In: Denham, R. L. (ed.) Typical Oil and Gas Fields of Southeast Texas, Houston Geological Society. Judson, S. A., 1927. Operations in the Gulf Coast of Texas and Louisiana for 1926. In: Petroleum Development and Technology in 1926, Petroleum Division, The American Institute of Mining and Metallurgical Engineers, pp 659-673. Lawyer, L. C., Bates, C. C. and Rice, R. B., 1982. Geophysics in the Affairs of Mankind: A Personalized History of Exploration Geophysics, Second Edition, 2001, SEG. Masters, J. A., 1980. The Hunters: Searching for Oil and Gas in Western Canada, Evergreen Press Limited, p 26. Mayuga, M. N., 1970. Geology and Development of California’s Giant – Wilmington Oil Field. In: Geology of Giant Petroleum Fields, AAPG Memoir 14, pp 158-184. Owen, E. W., 1975. 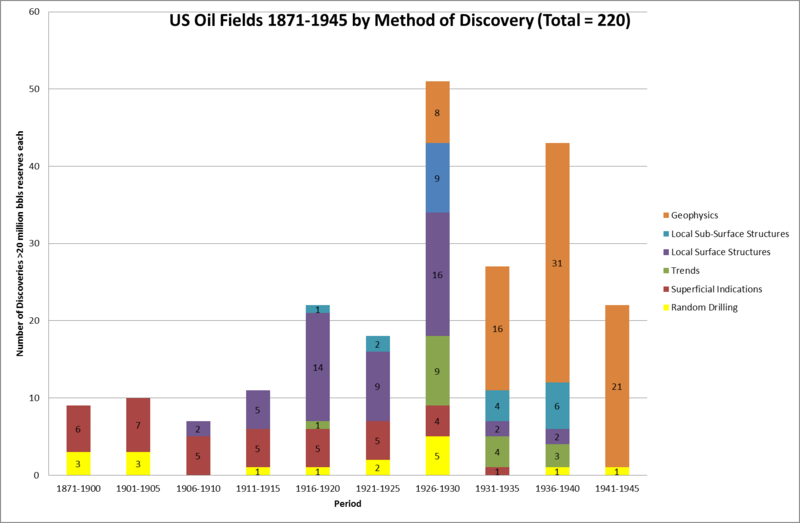 The Pattern of Oil Discoveries. In: Trek of the Oil Finders: A History of Exploration for Petroleum, AAPG Memoir No. 6, pp 457-462. Pratt, W. E., 1937. Discovery Rates in Oil Finding, AAPG Bulletin, vol. 21, no. 6. Pratt, W. E., 1943. Oil in the Earth, University of Kansas Press. Sweet, G. E., 1966, 1969. The History of Geophysical Prospecting: Vols.1 and 2. Third Edition, 1978, Neville Spearman Limited. Tait, S. W., 1946. The Wildcatters: An Informal History of Oil Hunting in America, Princeton University Press. Warner, C. A., 1939. Texas Oil & Gas Since 1543. Reprinted 2007 by Copano Bay Press. Weirick, T. E., 1930. Oil and Gas in Oklahoma: Pottawatomie County, Oklahoma Geological Survey, Bulletin No.40-TT.